Much noise has been made by strategists on both sides of the aisle who say the state’s anti-fracking movement, led by U.S. Rep Jared Polis (D-Boulder) who has promised to fund anti-oil and gas initiatives this November, may be cutting the electoral throats of Democrats this November. Gather around, PeakNation™, so we can explain. Republicans think that the estimated $10 to $15 million that will be spent attacking the Polis initiatives will drive more Republicans to the polls. Democrats, we have heard repeatedly, fear this as well. From the top of the ticket to the bottom, Republicans will be united against the Polis initiatives. And, most of the business community will be united behind them. Democrats won’t be so lucky. Every single candidate for elected office will have to choose between the environmentalists and the business community. That will be painful. Democrat strategists aren’t eager to see their candidates put in this vise. It will be particularly painful for the two men at the top of the ticket. Governor John Hickenlooper’s split with anti-frack organizations is well documented. This split will only grow as Hick speaks out against the anti-fracking initiatives. …Unless Hick doesn’t speak out against the Polis initiatives, in which case people will start wondering what happened to the frack-fluid-chugging Governor. So Hick has to speak out, unless he doesn’t speak out, in which case…oh, what a tangled web Polis has woven for the Governor. And, how will Senator Mark Udall deal with the mess that Polis is making? It is even trickier for him. Udall has been touting natural gas exports as a response to the Russia crisis. Pretty smart move by Udall. We can’t export natural gas, Senator, if we can’t first frack it. So, Udall will oppose the Polis oil and gas initiative right? Probably not…. Opposing Polis’ initiative is even harder for Udall. Udall’s wife, as the Denver media has ignored, is a mover and shaker in the national environmental movement with loyalties and money-ties that will make it next to impossible for Udall to oppose the Polis initiative. Since Udall has yet to cross over on any major issue in his term as a Senator, it is hard to believe this would be the time, especially when it would only create Hickenlooper-sized base problems for him, too. As Floyd Ciruli recently pointed out, Udall is probably also banking on outside money from the check writers in the Democratic Party who are motivated by Climate Change. Opposing the Polis frack initiative would be a climactic problem for these core Udall supporters. If Udall decides to support the Polis initiative, he creates big problems for himself. But, if Udall is against the initiative, he creates bigger problems for himself. If Udall chooses to stay neutral, Rep. Cory Gardner will have more proof that Udall is spineless. When you look at the whole scorecard, the anti-fracking panacea starts to look more like a 2014 nightmare for Democrats. For this nightmare, Democrats can thank Jared Polis. The only thing that could make this issue better for Republicans would be if Polis had a portion of his vast wealth invested in Big Oil. He does, you say? Ok that settles it. This issue couldn’t be better for Republicans. After last year’s disastrous legislative session in which the left’s extreme legislation cost Colorado jobs, you’d think that the left would ease off the ridicule of Colorado companies. Nope. 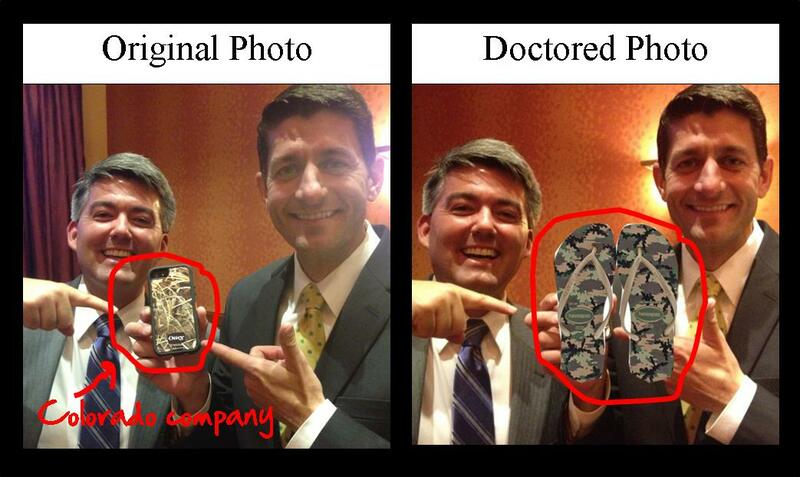 In trying to peg U.S. Senate candidate Cory Gardner as a flip flopper, the left doctored a photo of Gardner with…flip flops. How original. Maybe, next time, the left will try to attract millennials using keg stands. Oh. Wait. Anyway, as it turns out, the photo that the left used didn’t actually contain flip flops, but was a fun photo of Gardner promoting Colorado company, OtterBox. Perhaps the Left should refrain from using local companies that provide, ahem, local jobs in an attempt to vilify a Colorado candidate that’s actually doing what he’s supposed to be doing by helping a Colorado company thrive. The left’s poor behavior just reminds Coloradans how abysmally bad Dems are on small business issues. One of the greatest lies ever told to the American public – aside from President Obama’s “If you like your plan, you can keep your plan” – is the notion that our public schools are under funded. The performance of 17-year-olds has been essentially stagnant across all subjects despite a near tripling of the inflation- adjusted cost of putting a child through the K–12 system. Conservatives have been beating this drum for a while, but it’s hard for parents to believe them when the school supply list never gets any shorter and fees keep increasing. The truth is, too much of the money we send to our schools ends up in administration and not the classrooms. We saw this debate play out last summer when Democrats tried to pass Amendment 66, a billion dollar tax increase for education. While the measure failed miserably, it had more to do with the fact that voters were against the billion-dollar tax increase part rather than the spending more money on education part. But lack of proper funding is clearly not the reason for stagnant results, and it’s time that the mainstream media start calling the Left out when they try to make that claim. Despite an improving economy, more Colorado children were living in poverty in 2012 than at the trough of the economic downturn, according to an annual report that evaluates the well-being of children in the state. … About 224,000, or 18 percent, of the state’s more than 1 million children lived below the poverty threshold of $23,000 in annual income for a family of four in 2012, according to the Kids Count report set for release Monday. The numbers signal a rise in child poverty since the recession, when 210,000, or 17 percent, of youngsters in the state were from poor families. Looks like Markham took his own directive a little too seriously. The head of the state employees’ union is not pleased, according to voicemails left on the phones of several Democratic state legislators who sit on the state’s Joint Budget Committee. It all started when liberal Governor John Hickenlooper recommended that state employees receive a 1.5% base raise with a possible 1.5% merit pay raise in December 2013. A three percent raise isn’t bad. 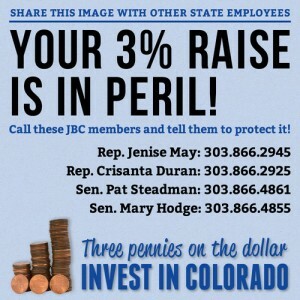 But, the JBC upped the amount to a 3% base raise, plus a 1.5% merit pay increase (for a total of a 4.5% increase), which went above and beyond the recommendations from the Governor as well as JBC staff, according to a Denver Post article. Then, the revenue forecasts came out. The 3% raise (not the 1.5% merit increase) was in jeopardy, according to the Colorado WINS tumblr, leaving a total of a 3% raise on the table. Last night, Complete Colorado‘s Todd Shepherd dropped a bombshell – a woman, Rebecca Ryan, calling Connect for Health Colorado (the exchange) directly asked an operator on the exchange whether she would be penalized for keeping her doctor on Obamacare. The answer from the exchange? Yes. Stop the presses PeakNation™, fractivists have a new strong ally! In a new story by, wait for it, The Voice of Russia some local Coloradans get a chance to create propaganda for Mother Russia. Normally, such absurdities would be allowed to whither on the vine, but when the study used as propaganda by The Voice of Russia is the same study cited during last week’s testimony for more fracking research, the absurdity of fractivists becomes that much more apparent. It’s hard to forget how politicized the wind production tax credit became during the 2012 presidential election. Vestas, the wind turbine manufacturer with plants all over Colorado, was living high on the hog at taxpayer expense until it began laying off workers right before the presidential election. The move was no doubt intended to pressure political leaders. Democrats took full advantage, even using a local Pueblo man who was laid off by the wind industry in one of their attack ads against Mitt Romney. A landmark report published by the American Enterprise Institute on state pension obligations last week delivered some troubling news for taxpayers across the country. In particular, it was interesting to note that the retirement benefits of Colorado career state employees ranked fourth nationally, at $60,420. The median household income in Colorado, according to the US Census Bureau’s latest data, is $58,244. That’s right, the average career state government worker is pulling in more in retirement than the median family in our state does on an annual basis. Another calculation that the AEI report evaluated was what the author called the “present value” of the retirement benefit. This calculation measures how much money an individual in the private sector would have to have saved up on the first day of retirement to replicate the annual benefit that he would receive as a career state government retiree. That number: an eye popping $1,250,000 for Coloradans, and this does not include the value of someone’s house. Colorado also ranked #4 in the “present value” of the state retirement benefit. Unquestionably, career state employees have a good deal. However, whether this system can be sustained is in question. The growth of the state government over the past generation, combined with improvements in medicine that are leading to longer retirement periods, has put taxpayers in a tricky situation. A 401(k) type retirement plan, ubiquitous in the productive sector, would be an alternative that could give more predictability to the pension liabilities that Colorado taxpayers are on the hook for, and it could also be beneficial for state employees as well. A 401(k) style plan would have an actual cash balance that would belong to the worker, and be portable to other jobs, making the state pension plan more fair to people who only work at the state for a few years. The ability to pass on the value built up in one’s pension fund to their heirs is another attractive feature of this option. Finally, the transparency of a 401(k) style account, for both the employee and the taxpayer, would be beneficial in the long run. Transitioning to a 401(k) system for new state employees could actually be a win-win. Colorado taxpayers can better understand what their actual pension liability is for their government workers, and new state employees will enjoy an asset that is theirs to invest, take to a new job, and pass on to their children. With its population almost doubling in the same period from 60,000 to 100,000, Greeley continues to attract more and more people with good-paying jobs. Yet, all was not always harmonious between fracking and Greeley. Even before it was fashionable to be anti-fracking, Greeley was trying to ban it back in 1992 (does that make Greeley the hipster of anti-fracking? “I was anti-fracking before it was cool”). Voters passed a ban on fracking that was in clear violation of property rights protected by the federal and state constitutions. The Colorado Supreme Court ruled in Voss v. Lundvall Bros. Inc, in 1992, to overturn the ban on the basis of its conflict with property rights.